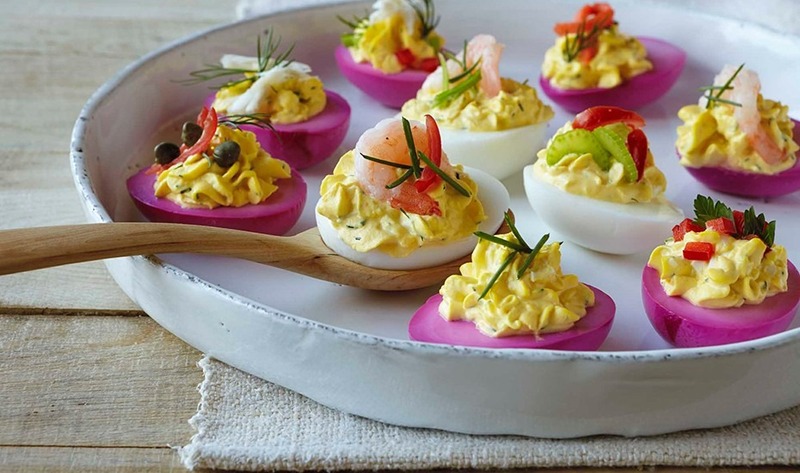 You are here: Home / Holiday / Easter / Pickled Deviled Eggs Recipe + Easter Twitter Party! 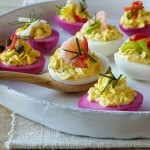 Pickled Deviled Eggs Recipe + Easter Twitter Party! One of my favorite holidays is coming up – Easter! This is a super busy time for not only families, but for Ohio egg farmers! Did you know that my home state of Ohio is ranked second in egg farming nationally? They produce more than 8.7 billion eggs each year – how crazy! I’m excited to share a delicious deviled eggs recipe for those eggs with you today, as well as some more fun facts and tips! Eggs are one of nature’s most perfect foods. The protein that is found in eggs is the highest-quality protein found in any food! Not to mention, at just 70 calories, there are 13 essential vitamins and minerals, unsaturated fats and antioxidants in one large egg. A hard-boiled Easter egg should be eaten the same day if you peel it. But if you keep it in the shell, you can refrigerate them and they’ll last for up to one week. Meet the Weaver family, who are egg farmers from Versailles, Ohio. You can go on a tour of their egg farm virtually! You never know, your Easter eggs may just come from their farm! Q: When should you buy eggs for Easter? A: Very fresh eggs can be difficult to peel. For easily-peeled Easter eggs, buy and refrigerate them a week to 10 days in advance of cooking. This brief “breather” allows the eggs time to take in air, which helps separate the membranes from the shell. Q: How do you make hard-boiled Easter eggs? A: Hard-boiled eggs should be cooked in hot, not boiling, water. When the water comes to a boil, turn the heat off, remove them from the burner and let them sit in the hot water for 12 minutes (for large eggs). Watch this easy-to-follow video for step-by-step instructions on how to hard-boil eggs. Q: What’s the best way to peel Easter eggs? A: Gently tap the hard-cooked egg on countertop until the shell is finely crackled all over. Roll egg between hands to loosen shell. Starting peeling at large end, holding egg under cold running water to help ease the shell off. Drain beets, reserving juice (about 2/3 cup). Set beets aside for another use. Combine beet juice, water and vinegar. Arrange egg whites cut side down in shallow container. Pour beet mixture over eggs. Cover tightly. Refrigerate at least several hours or overnight, turning occasionally. Remove purple egg whites from beet mixture, pat dry with paper towels. Spoon 1 heaping Tbsp. yolk mixture into each reserved egg white half. Garnish with toppers, as desired. Note: Mix and match your toppings! The possibilities are endless – shrimp, chives, smoked salmon, crabmeat, capers, diced red bell pepper, Italian parsley, cucumber, fresh dill, etc. 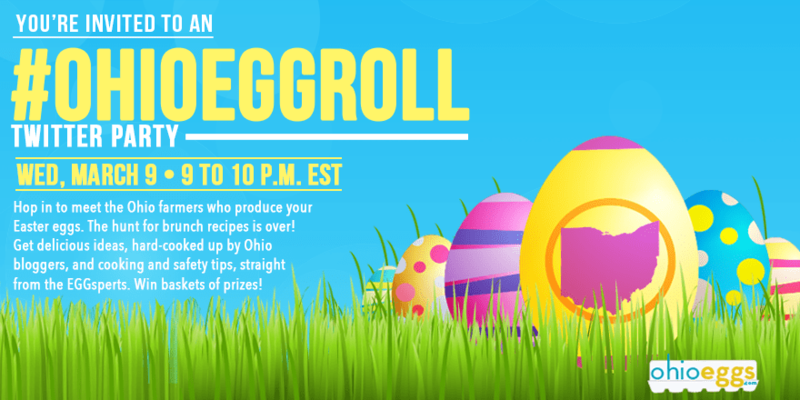 To get you ready for Easter, make sure to join the #OhioEggRoll Twitter party going on this coming Wednesday, March 9th from 9-10pm EST! You’ll get yummy recipe ideas, as well as cooking and safety tips. Oh, and there will be awesome prizes up for grabs! Make sure to RSVP now! Disclosure: This post is sponsored by the Ohio Egg and Poultry Association. All opinions, as always, are my own! You made them look so pretty too. My son loves deviled eggs but mine never look so good.